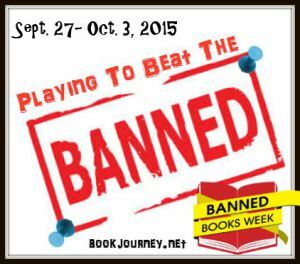 Thanks to Sheila at Book Journey for hosting this Banned Books Week event. Many other bloggers are participating and offering their own take on Banned Books. Be sure to check out her site for related posts this week! A banned book is the removal of a reading material that someone has protested. A book challenge involves an attempt to remove material from school curriculum, a school or community library, or a retail store, which then restricts the access of the book to others. No one should be able to choose what I read. The only people I should be able to challenge what they read are my children. Obviously I wouldn’t want my 5 year old reading THE KITE RUNNER or even my 10 year old. But I am not saying she could never read it. There are appropriate times to read certain books and I think that is a parent’s decision. But, it isn’t MY decision to make for someone else’s child. I wouldn’t want someone saying THE HUNGER GAMES can no longer be in our library because a parent doesn’t want his child to read it. Just don’t allow your child to read it until that child is mature enough to handle the content. If your religion or belief system doesn’t allow you to read a book, don’t read it. But your belief system isn’t the same as mine, so don’t apply it to me. If you think this is something that happened in the 1950’s and is no longer an issue….WRONG! I just happened to see this article a couple weeks ago. A mother is trying to ban the book THE IMMORTAL LIFE OF HENRIETTA LACKS by Rebecca Skloot. I read this book and found it extremely fascinating. This mom is trying to ban it because her 15-year-old son was reading it and read some passages to her that she felt they was pornographic. Ok, if you don’t know anything about this book, first of all, read my review, HERE. To see more about that story, click HERE. Should this book be in school libraries? Not for me to say. But I could see this piece of history being discussed in an upper lever science or ethics class due to the situation Henrietta Lacks was going through. So, as part of Banned Books Week, I am asking parents to be knowledgeable about what your child is reading. Get involved and maybe even read the book with them. Research reviews and find out who the intended audience is for the book. If it doesn’t sound like something your child would enjoy or should be reading, then find them a new book. Don’t take it away from others who may want to read it. and form their own judgments. through the reading of every book imaginable. I have accumulated a list of banned/challenged books that have left an impression on me. I have read every one of these books and even though I may not have liked them, I found them to be an important piece to my reading knowledge. I would be sad if I hadn’t had the opportunity to read them. This book is taught in our school’s Junior English class and since I sub in that class, I have had an opportunity to have discussions about racism with students. Even though language is used that is no longer appropriate, it shows the time setting of the novel and the ignorance of the characters. It’s an important novel to read and discuss. Even though “bullying” is the buzz word for schools now, bullying was happening long before it became the focus of many schools. In this novel from the 1970’s, Blume hits on the realities of bullying and the one being bullied. One of my favorite books of all time. But, there are some terrible events that happen in this book that are not for young eyes. This collection of short stories are based on soldiers during and after the Vietnam War. The stories depicted aren’t for younger eyes. But, these stories need to be heard and can be appropriate for high school students, especially during a study of the war. A horrific and sad story. But there are so many evil and twisted novels out there, that this one is calm in comparison. Does everyone believe in ghosts and in the type of heaven described in this novel? No, but just because you are reading it doesn’t mean you have to believe it. It’s a story. I’m not sure I would have gotten through puberty and teen years without reading this book. Obviously, this is a highly controversial book. I read it, but did I believe everything in it? No. Did I find it interesting and enjoy the story? Yes. Try not to take everything so seriously. It’s a NOVEL! Again, another wonderful children’s story that teaches us to take care of our world and those we love. How can that be wrong? Obviously there is some language and graphic scenes in this book that are not appropriate for all ages. I didn’t read this book until I was in college. But, that is part of being knowledgeable about your child’s reading and maturity level and what they are reading. I can’t imagine why this beloved book from my childhood would be banned. The devotion and love that Charlotte showed to Wilbur was a true sign of friendship. What child doesn’t need to learn that? Science Fiction is not my usual genre, but I wanted to know what my kids were reading and what all the buzz was about. This series has gotten reluctant readers to be excited about reading. Even though I didn’t read the rest of this series and am not of fan of vampire novels, Meyer’s books have contributed to teens and adults being excited to read and voraciously reading through series to find out what has happened to their favorite characters. I know there are hundreds of other novels that have been banned or challenged and I’m sure I could talk about many more of them. But, my point is still, if you are banning a book, you are essentially taking that book away from someone who may really appreciate the story. Do you really have that right to say what I can or can’t read? Do I have the right to say what you can and can’t read? I hope not. Excellent post Stacie – love that you featured the Henrietta Lacks book – I really enjoyed that one too and was shocked to see it making the challenged list. Enjoyed your post, Stacie. I agree that parents should take an interest in what their children are reading, but never at the expense of the right of other to read. Being an old lady has afforded me the opportunity to read lots of books. Some banned, some not. I still am offended by the book reading community who continue to "object" to books that I have read. I guess they have a right to their opinion, but it seems disrespectful to me to make comments about my selections. Just IMHO! Thanks, Stacie, we all have a job to do enlightening people about the importance of choosing for oneself and one's children, but not for everyone else!